The village of Wheatley Ontario is home to the largest fresh-water commercial fishing fleet in the world. originally part of the homelands of the Neutral Indians, the area was opened to settlement about 1818. Richard Wheatley was the first to follow the Talbot Road to the area. As more settlers arrived, a community took shape. In part because of nearby conservation areas and provincial park, Wheatley is one of the best bird-watching areas in Ontario. The lake has abundant stocks of perch and pickerel (walleye). As noted above, it also has a large commercial fishing industry. The approaches to Wheatley are clear from all directions. Generally, you want to keep a lookout for any fishing nets (marked by flags). Coming from the west, give Pt. Pelee a wide berth due to shoaling from its tip. There is an offshore breakwater about 270 ft/82 m SE of the harbour entrance.There is shoaling off this breakwater. The recommended approach to the harbour is from the southwest. The entrance is marked with an ISO RED light at the end of the east breakwater and a Fl RED light at the end of the west breakwater. When you enter the harbour, the commercial fishing dock is on your starboard and a basin for recreational sailors is on your port. There is space for transient sailors on the floating dock. Wheatley Harbour Authority operates the municipal harbour. They have about 6 slips for transient sailors.. There is no fuel fock or pumpout station. There are power hookups but no potable water. There are no restrooms or showers. The Village of Wheatley is about 2 mi/3.6 km north of the harbour. There are no repair or maintenance facilities in Wheatley Ontario. There is a Royal Bank of Canada branch in the village with counter and ATM service. There is no medical facility in Wheatley. The closest is Leamington District Memorial Hospital (519) 326-2373 in Leamington, ON, about 9 mi/15 km west. Adamson Guardian Drugs (519) 825-4111 is located in the viallage, about 2 mi/3.6 km north. The Car Barn restaurant has been a fixture in the village for many years. Catch Of The Day is a bakery/cafe in the village. It has internet access as well. Wheatley Ontario is primarily a harbour of refuge. But, if you would just like a quiet day off the lake, it can be a pleasant stopover. August sees the annual Fish Festival. There are weekly outdoor concerts at the conservation authority. If you like to fish, this is certainly the place to try your luck. Everything from perch to king salmon abound in these waters - a reason why locals call this the Freshwater Fishing Capital of the World. The Wheatley Ontario page on the county tourism site will give you an idea of lots more things to do and see while visiting the area. Something To Add To This Port Review? Do you have a great story about this port? Met some memorable people? Found a great bar or restaurant? Is there something about this port that other sailors should know? Here's your chance to add your voice! Please reference the Port you are writing about (makes it easier to keep track). Small changes or updates will be done as I receive them. Please include your email address. I cannot post anonymous submissions or reply to questions without it. It will never be included in your submission. Commercial submissions will be replied to separately. 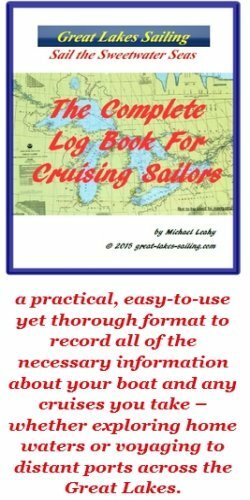 Copyright 2011, 2012 Great-Lakes-Sailing.com. All Rights Reserved. Permission is granted for individuals to print single copies of our web pages for personal, non-commercial use, as long as the pages are unmodified and our copyright notice appears clearly on each page.